Q: I love showing Mom how much she means to me on Mother’s Day, but it costs a small fortune! Is there any way to spend less while still giving Mom a Mother’s Day to remember? A: It’s wonderful to show your love and appreciation, but you don’t need to blow your budget to make that happen. Give your mother a day off – at home! Make arrangements for Mom to be completely free of all housework on her special day. Offer to assume responsibilities of all her daily chores, being sure to tidy up as per Mom’s standards and to prepare all her meals. Search your neighborhood forums for local attractions that don’t have an admission fee. You might get lucky with an interesting museum or a beautiful overlook point just a small drive away. Otherwise, prepare a picnic lunch, bring along some balls and Frisbees and spend the day at a scenic park, together with the whole family. Spend some time gathering and editing the best home video footage you can find. Put it all together and present your gift to Mom on her special day. Then sit back and reminisce together about the good old times. If you can’t get around spending money on Mom’s gift, search for seasonal discounts online before spending a penny. You’ll find excellent Mother’s Day deals on Amazon, Coach, Kohl’s and other major retailers. Spend a relaxing day at home while binge-watching Mom’s favorite movies together. Prepare lots of fresh popcorn and all of Mom’s best snacks, pour her a glass of her favorite drink and get comfy on the couch. Remember: Mom is in charge of the remote today! If you know your mom is looking forward to a dinner out, look for local restaurant deals before deciding on a place to eat. Lots of eateries offer special Mother’s Day deals or even free menu items just for moms. Save on Mom’s bouquet by purchasing your flowers in the supermarket and arranging them in a vase or pitcher you already have in the house. For a fun family activity, turn your favorite games into Mother’s Day material. Put together a list of random questions about Mom’s life, hobbies and daily schedule and then play Trivial Pursuit. Pass around the most hilarious pictures you can find of Mom and let everyone take a stab at guessing when and where they happened. Get creative and host the family game night that Mom will always remember. With a bit of research and proper planning, you can give Mom some priceless memories she’ll cherish forever. 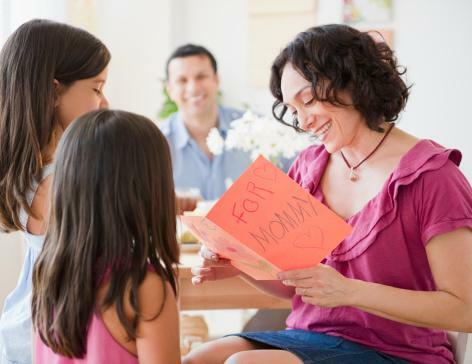 Your Turn: How do you celebrate Mother’s Day without draining your wallet? Share your best tips with us in the comments!